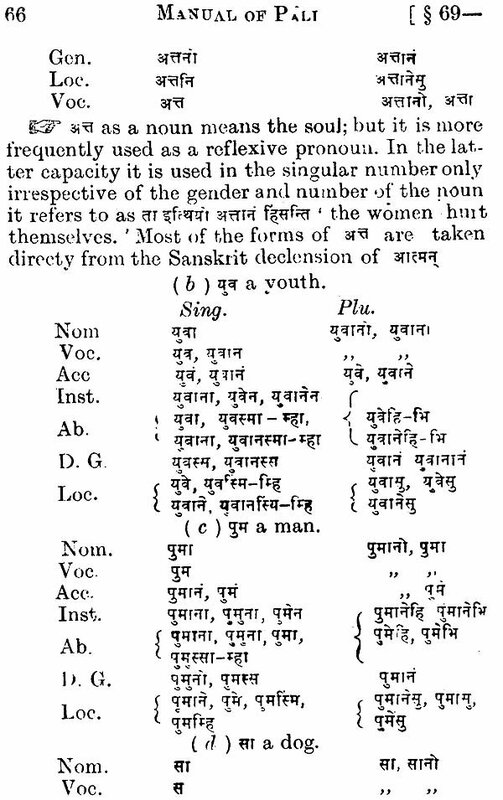 The Pali language was derived from Vedic Sanskrit; its former name appears to have been Magadhi, the dialect of the Magadha country. The name Pali to the language was given later. 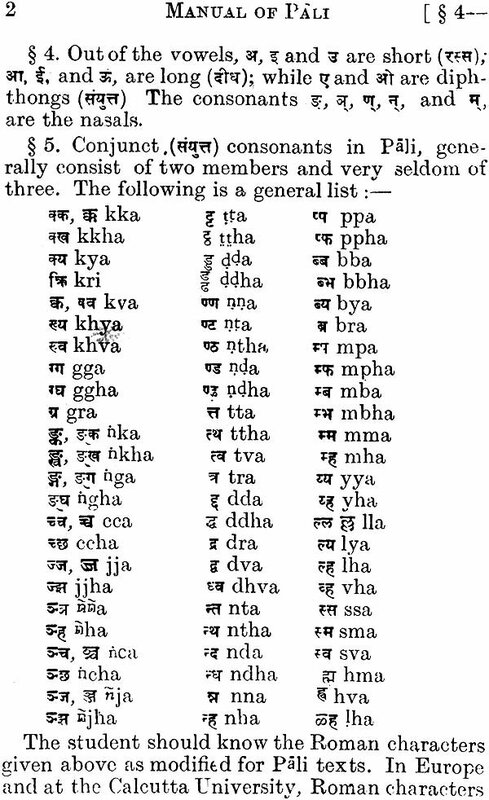 Really speaking Pali ( a line ) is the Tripitaka text as distinguished from the Tika or commentary, the latter always referring to the former as Pali. 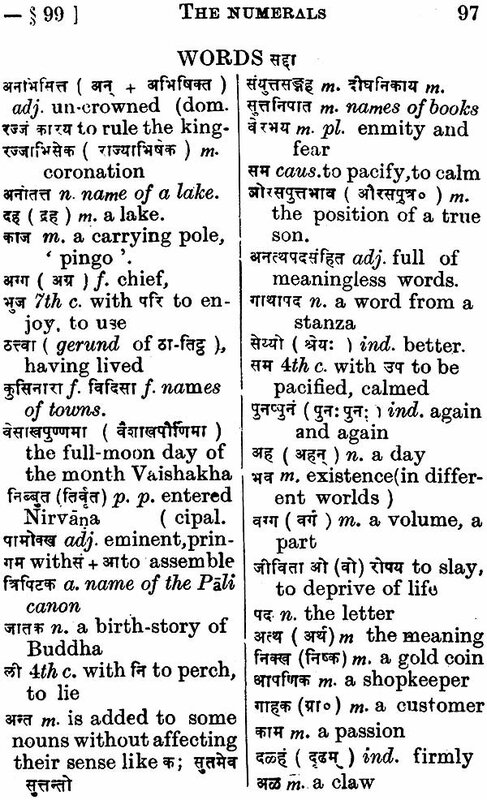 Gradually the connotation of the word was enlarged and it came to be applied to every composition in Magadhi and consequently to the language itself. The language was the vernacular of ancient Magadha, in which the great Buddha preached his doctrine to every man and Asoka inscribed his immortal message to generations. A study of Pali is of great use to the students of Philosophy, ancient history and philology. 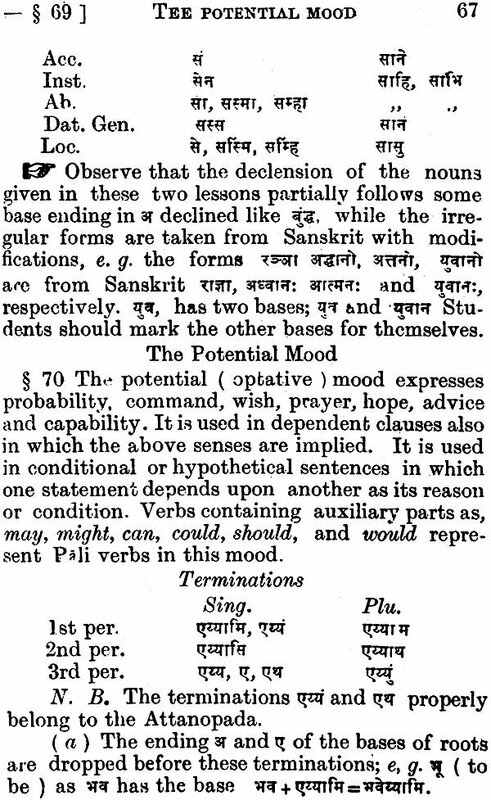 Yet the want of a suitable text-book on Pali grammar presented a great difficulty to the Indian student, who was already equipped with a knowledge of Sanskrit grammar and whose mother tongue consisted of a Sanskrit and Prakrit vocabulary, as similar to the Pali as any two Provincial dialects in the same country. 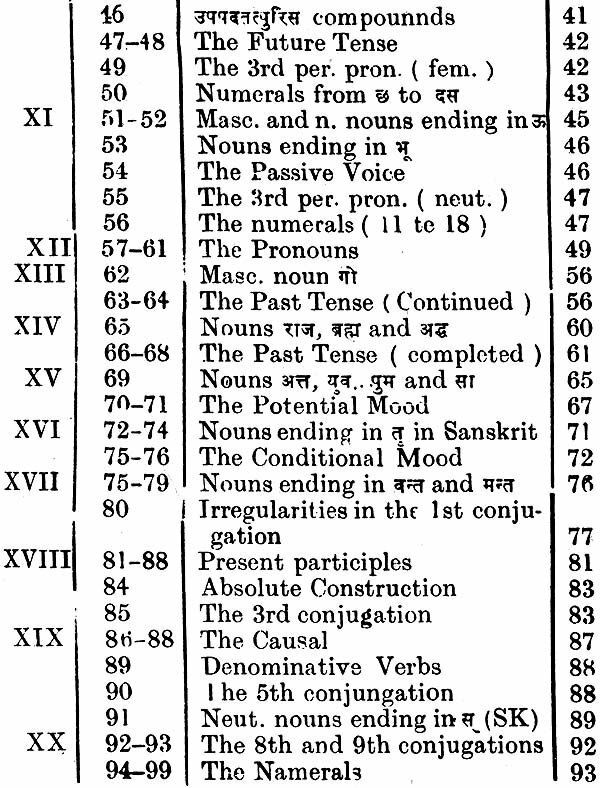 The texts on Pali grammar treated the Pali forms without reference to the rules of Sanskrit grammar, but this method cannot explain numerous forms which are bodily taken from the corresponding Sanskrit ones. 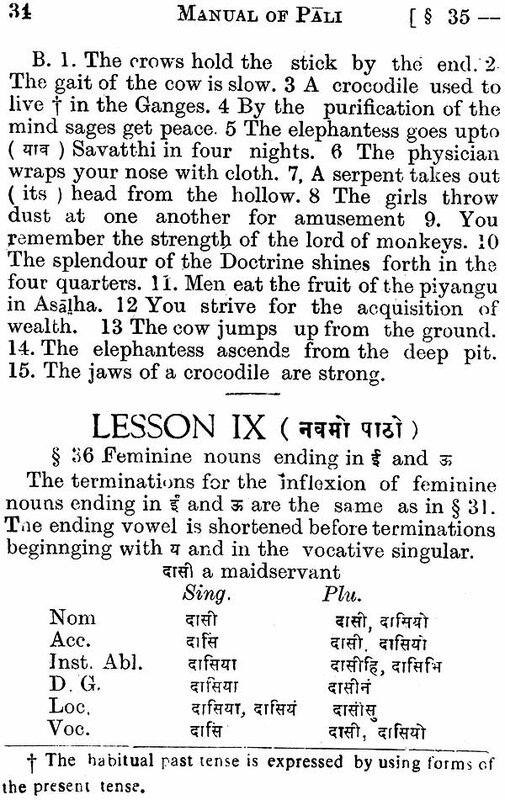 My method is to follow Pali rules as far as practicable and to point to the Sanskrit formations when Pali rules are not adequate to explain them. 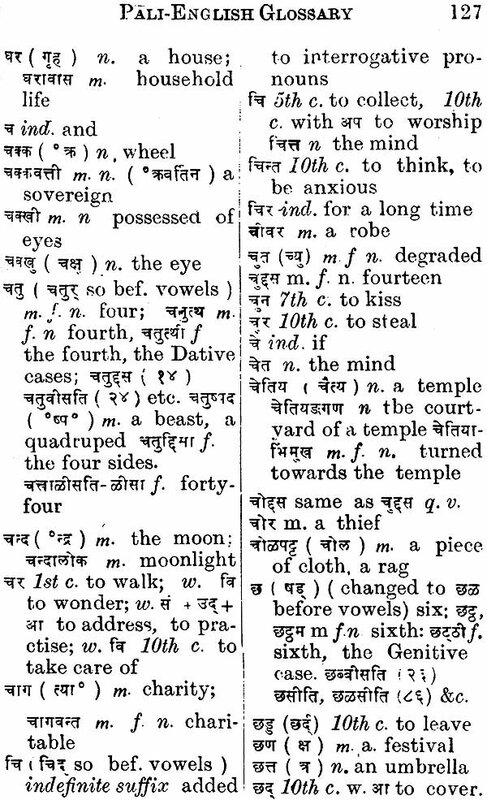 In the treatment of the verbs, I am following the Sanskrit system with its ten conjugations and not the Pali one with its seven. 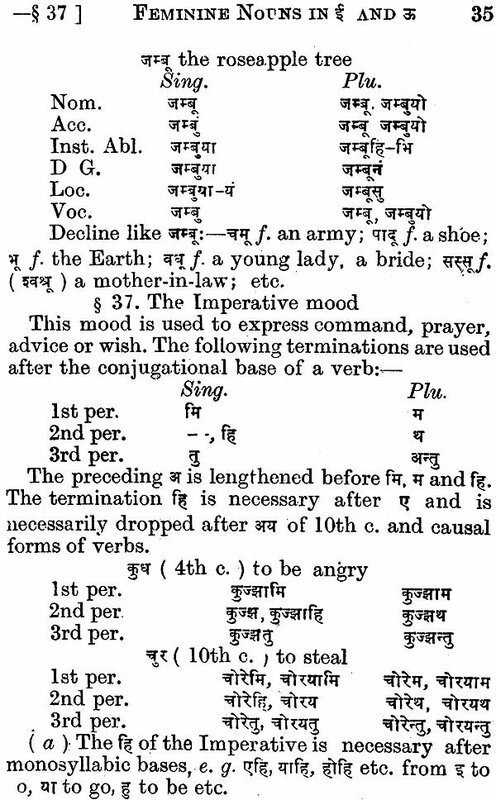 The latter system which puts the roots us, hu, ha, tudh & c. under the 1st conjugation cannot account for the peculiarities in the conjugation of these verbs. I have not treated the Attanopada, which is rarely represented in literature except on a few occasions in Poetry and in the Passive voice, where too its presence is an exception rather than a rule. Similarly I have dispensed with the three preterite tenses in preference to a single Past Tense. In declension also I have avoided the multiplicity of forms in which the Pali grammarians indulge excessively. 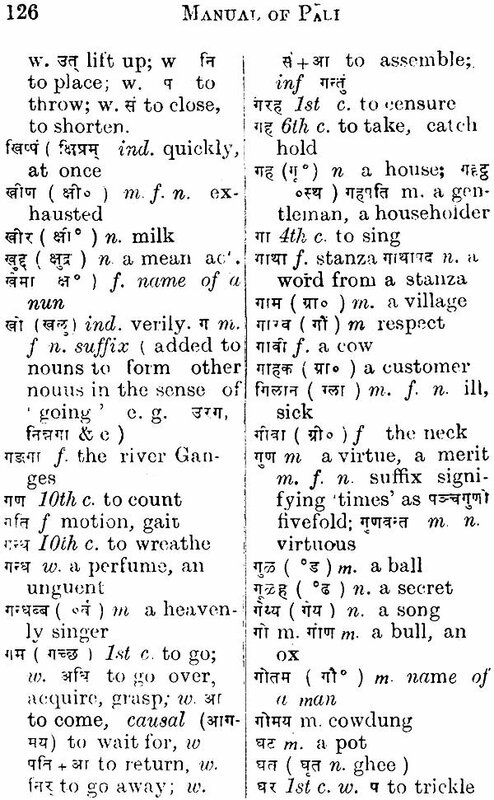 Students wishing to appear for the Matriculation, Entrance or School leaving examination are recommended to study the elements of Sanskrit grammar before taking up Pali, a step which will facilitate their work. 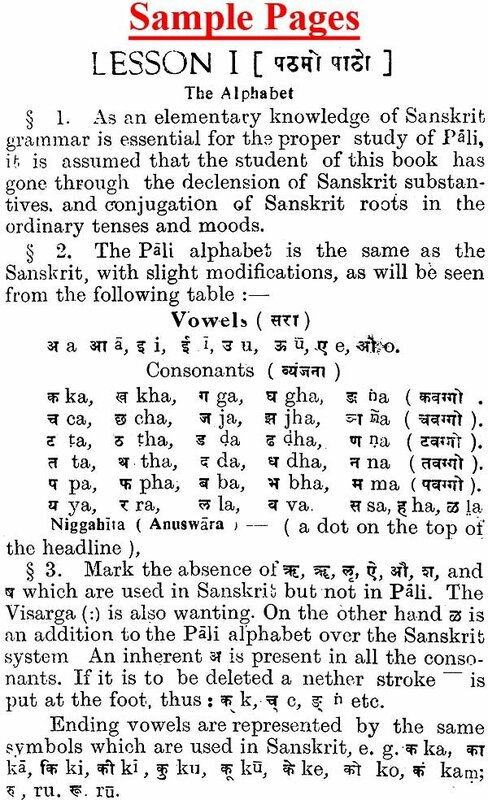 Those who are advanced in Sanskrit will find a study of Pali very delightful as it may form an acquaintance with the joining link between Sanskrit and their mothertongue. 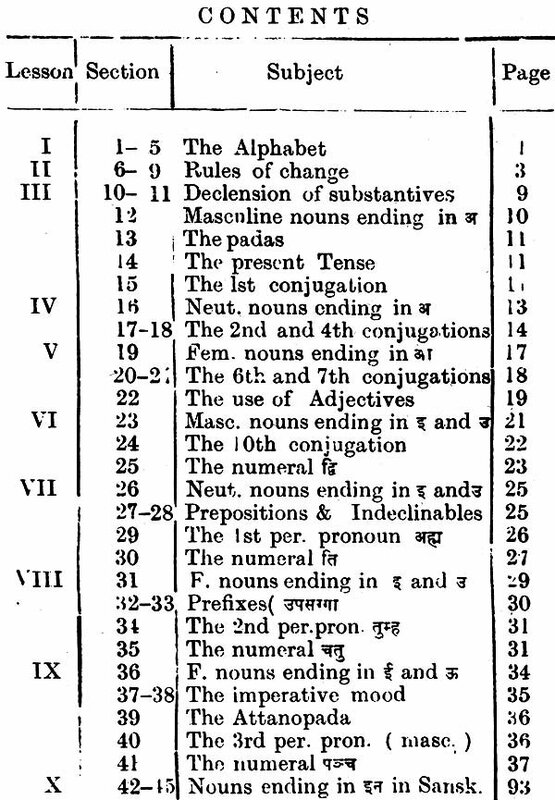 A chart of the Roman, Burmese, Sinhalese, Siamese and Brahmi characters has been appended to the book for scholars who want to read Pali books printed outside India. 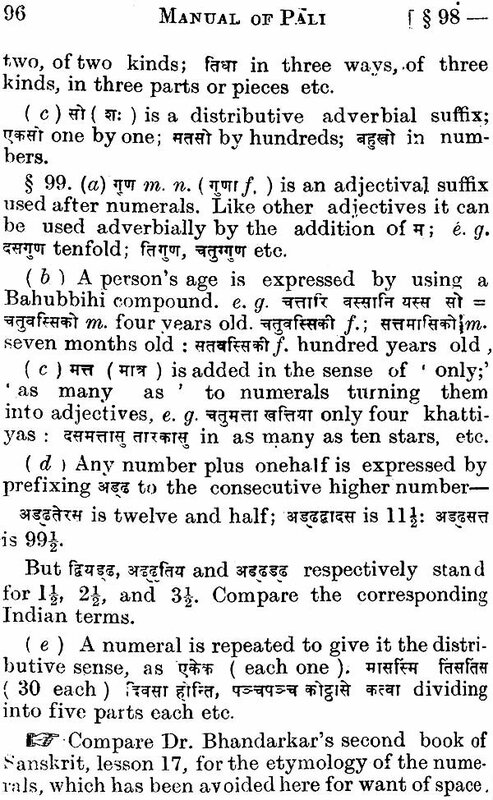 All the Pali books are not yet available in the Devanagari characters but it is hoped that in the near future it will be an accomplished fact. The book has been recognised by University in and out of India, to whom the author is grateful.